Best known for his groundbreaking studies of animal and human locomotion, 19th-century photographer Eadweard Muybridge was also an innovative landscape artist and pioneer of documentary subjects. 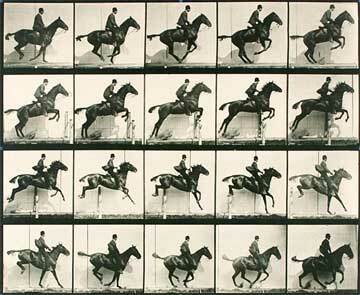 Helios: Eadweard Muybridge in a Time of Change is the first retrospective exhibition to examine all aspects of Muybridge’s art. Structured in a series of thematic sections, the exhibition includes numerous vintage photographs, albums, stereographs, lantern slides, glass negatives and positives, camera equipment, patent models, Zoopraxiscope discs, proof prints, notes, books, and other ephemera. Over 300 objects created between 1858 and 1893 are brought together for the first time from numerous international collections. Muybridge’s only surviving Zoopraxiscope—an apparatus he designed in 1879 to project motion pictures—will also be on view. Organized by Corcoran chief curator and head of research Philip Brookman, the exhibition will also travel to Tate Britain in London from September 8, 2010 through January 16, 2011, and to the San Francisco Museum of Modern Art from February 26 through June 7, 2011. A catalogue of the exhibition, with new essays by Brookman, Marta Braun, Andy Grundberg, Corey Keller, and Rebecca Solnit, will be published Steidl. Plan your visit . . .
Republished from the Montreal Gazette. They’re as Montreal as smoked meat, street hockey and the two-cheek kiss. They sprout like mushrooms in the spring thaw. They wreck car suspensions, wreak havoc on cyclists and give our city a Third World veneer: potholes. Spring had just sprung this year when Davide Luciano and Claudia Ficca were cruising through Outremont in their 1997 Jetta and they hit a big one, “really hard.” “Six hundred dollars later, we came up with the idea of using potholes in a positive light,” explained Toronto-born filmmaker Luciano, 31. “We started thinking, ‘What’s useful about these craters, what good can we bring to our city?’ ” said Ficca, 27, a recent Concordia University graduate in Italian language and literature. 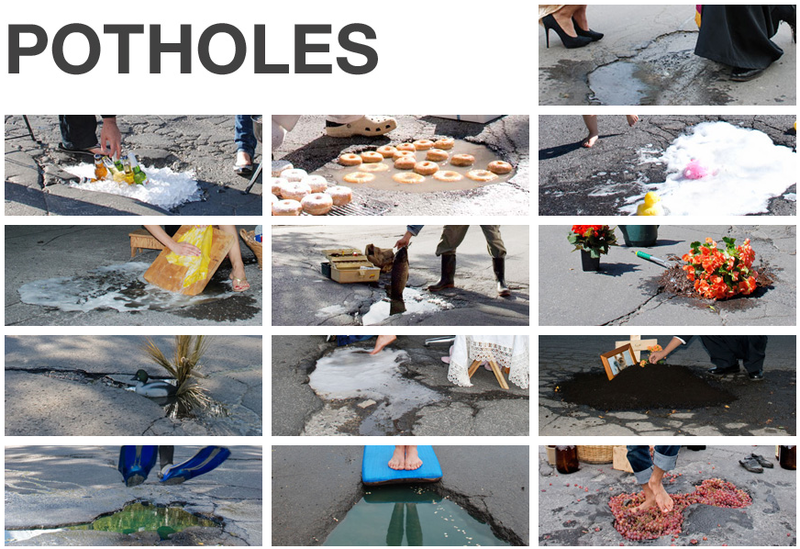 As both are photographers, they began imagining scenarios for a series that might be called Theme and Variations on the Pothole. They recruited family and friends, and got started. “They were game enough to put themselves out there, in the middle of the street, dress up like fools – and be laughed at by drivers,” Ficca said of their subjects. They started shooting a few weeks after replacing the rear suspension on the Jetta. The photo sessions were mainly done during the evening rush hour, when subjects and natural light were available. Drivers stopped in amazement and passersby laughed, the couple said. Most understood that this was about having fun with our urban curse. “We rented or borrowed props, called our friends, and took it from there,” Luciano remarked. It was a team effort for the couple, who took turns shooting with a Nikon D 80. A gardener was shot planting flowers in potholes. And Luciano posed as a “wine maker” squashing grapes barefoot in a nice hole. Each photo is named for the street on which it was shot, and the series will be on exhibit Wednesday night. View photos . . .